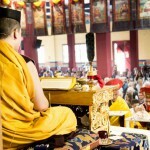 Khenpo Karma Ngedön on the purpose of Dharma Studies. First of all, I would like to pay my greetings to every one of you here. I was fortunate to join, fortunate to come to KIBI and to participate in the Public Meditation Course, fortunate that I could share some words and some teachings with you. Today I do not have a particular subject or a particular thing to teach you. Rather, I have my opinion that I would like to share with you. 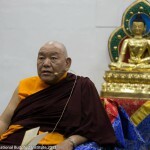 In fact, I requested Khenpo Ngedön to give us a short lecture regarding his vast experience with Buddhist studies, especially because after his graduation he was sent to KIBI to teach, and then he taught here a long time. I think from 1993/94 onwards he has been teaching here, so he is also part of KIBI and has a lot of experience of KIBI, of the history of KIBI’s situation regarding its academic system and so forth, so I strongly requested him to share his experience of this subject with us. In general, in terms of study structures and in terms of the administrative system of the current KIBI -the study system and the administration that you are experiencing here now- and especially in terms of the academic studies of Buddhism, you actually have the best person to get instructions and advice from in Professor Sempa Dorje. 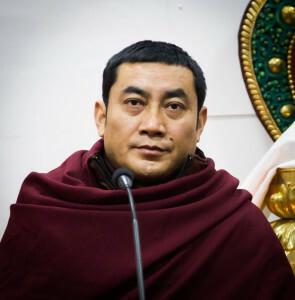 There are many scholars these days in this world, especially in Tibetan Buddhism, but it is very rare to have such a scholar as Professor Sempa Dorje, who is not only a scholar but also someone enriched with his inner practices and his experience. I consider that the top-most living scholar with regards to inner practices and experience is Professor Sempa Dorje. So I hope you can really cut out your doubts about Tibetan Buddhism. Among all the different schools of Tibetan Buddhism you will find practitioners that may have doubts in terms of studies and practices. But because of Professor Sempa Dorje’s vast knowledge of all these schools, you can definitely get great answers -which are why you are so fortunate to be around him in KIBI. 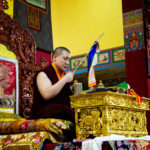 One more thing; you, the students, are also very fortunate because you are staying close to Gyalwa Karmapa and because you have opportunity to receive teachings and initiations from him from time to time. So all these opportunities are not just popping up coincidently, they do not just happen like that. I believe that all these present opportunities are being provided to you due to your previous great accumulations. It is neither an easy nor a cheap thing to meet such a great scholar as Professor Sempa Dorje or such a master as Gyalwa Karmapa. But you are not simply meeting them, you are actually staying around them, we here are staying around them. So we should all realize how fortunate we are. Besides that, KIBI has provided Buddhist studies for a long time, but nowadays along with that you can receive a proper degree. This will not only help you in the next life, but also in this life it helps you to get a job. Actually it will be a benefit for this life and for all future lives. So I really think that all of us here, all of you here, are very fortunate to be here in KIBI. KIBI has had this study purpose for a long time; however we have nowadays more of an affiliation and collaboration with universities that are recognized by the government, which helps you to make more sense of the studies in modern times. Gaining a Bachelor degree in Buddhist studies will help you to go deeper in your studies, which are highly regarded in modern universities. In general, there are many universities in which you can pursue the higher, longer studies. 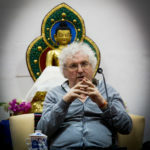 But as we are engaged in the study of Buddhism, it is different for us; the Buddhist studies are not only for this life, or for us to live this life in a different way, but are actually the most beneficial of all studies. So I really think that Buddhism and the study of Buddhism is a treasure of the Earth, a treasure of the world, which produces all the happiness and benefits one can wish for in this world. If someone is a Buddhist practitioner, he can consider his study of Dharma as being of great benefit both in this life and in the next lives. If someone is not Buddhist or does not believe in rebirths, it will also be of benefit for this life, definitely. These points are not just intellectual ideas that I am sharing, but these I really believe from the inside. These are the points which I share with you from my experience. So by this, I wish to emphasise how very fortunate we are to engage into the study of Buddhism. 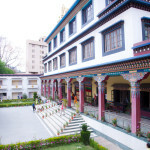 For Buddhist studies there are many institutes or places where you can go to. 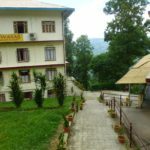 But the reason it is particularly and significantly important to study in KIBI is that this Institute has been blessed by Karmapa himself, and that currently KIBI is the place where Gyalwa Karmapa actually resides. And along with that there are qualified teachers here, especially someone like Professor Sempa Dorje. Getting knowledge and studying from them is not common, it is not ordinary. By integrating the meaning of this, one can really imagine how fortunate one is to be here. And if you can directly interact with Professor Sempa Dorje, you can actually make questions and answers and really cut off your doubts in Buddhism. So these chances do not just regularly appear; we can actually contemplate the importance of this opportunity, and we should also understand how valuable the moments that we have here really are. In general, when we look around the world, there are of course many so-called “Buddhist practitioners”. But -and probably this is my impure concept- many of them do not have the right knowledge of the Buddha-Dharma. There are so many people who have their misunderstanding and this is why, as we have mentioned during the Meditation Course, most of us have a lot of doubt inside. When we have doubts, then we look for answers and we ask questions. Those who ask questions -once they have found a qualified teacher- they receive the same answer as they would have from the past Buddhas and the past great masters; but they are not satisfied with this answer because they are looking for the answer they want, not the truth. So that represents the lack of understanding of the Buddha-Dharma. So you here are -as I mentioned before- really fortunate and you have great teachers, especially with Professor Sempa Dorje and His Holiness the Gyalwa Karmapa. Thanks to their blessing and also to your own accumulation of merit in the past lives, all these many conditions have come together and these great events take place in your life. That is, I would say, the greatest part of your life. But then, of course, as a practitioner and as a student, one has to respect one another, one has to try to be humble and respect the teachers, and one needs patience. Those are the most important elements in order to bring harmony. It is very important to mention your conduct and manners, and the aspect of bringing harmony between the students, by respecting one another. These are all very important because, since you are here in KIBI, then you are also responsible for the Institute; this is not just a common institute but it carries the name of Gyalwa Karmapa, and that makes a big difference. Therefore it is important to lift up the reputation of the Institute while you are here. It is important to have patience; when there is a sort of small conflict, it is good to have a little patience to allow things to settle down. 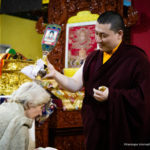 If you maintain your manners and try to lift up the reputation of the Institute, then somehow the Institute flourishes, which is one way of properly paying service to the Gyalwa Karmapa. Such behaviour of maintaining one’s conduct, one’s manners, by cultivating harmony and respect is not only found in institutes -this attitude is also necessary within a family circle. But of course, within institutes and within communities, these are some of the things which you should have within you, among the students. If you maintain all these things, then there is always peace and happiness within the community, just like there would be in a family. So, there may be some problems in your individual life while living in the community, but you should always look further. Your mind should not be sort of suffocated or short sighted. You should always think about the longer and wider aspects, the greater objectives. You should think about the Gyalwa Karmapa’s reputation, and of Professor Sempa Dorje’s; you should think about the reputation of such noble people, because if you do something bad and create conflicts, the bad reputation actually goes to them. Therefore you should keep that in mind, and have a little patience when there are small matters arising, trying to be patient in dealing with them. And if you really manage to be a good person -developing qualities while you are studying here- then you also become a great example for your family, your friends and your community. Some of you may have children now and some of you might have children in the future, so it is even a good example for your own family and the future generations. By generating and maintaining these qualities, then you are actually giving a good example to your family, and it can even be for your neighbours, and eventually it affects the whole country; and then one day, maybe, you can show this good example on the international stage. Therefore, by leading by example it can eventually contribute universally, enabling this Earth to become more harmonious, peaceful and happy. This is why we consider these qualities as very important. Another thing that I would like to share with you is that sometimes, in the beginning, it happens that one might have a great interest upon studying, an interest that comes along with great enthusiasm. But later, when you are a little bit learned, when you know a bit more, then somehow you start to forget the place where you studied, you start to forget what you learned from your friends and your parents, and you also forget the teachers who taught you the knowledge. A little knowledge can be dangerous; you need complete knowledge! I am not saying that it happened in KIBI –this is a general case that I have seen in this world. This happened in other places. 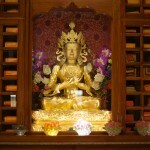 The reason for studying Buddhism is actually to improve, or develop, the conduct of one’s body, speech and mind. Otherwise, these meritorious studies might not be helpful. Therefore, in Buddhism, all of this -why you study, who your fellow students and teachers are- becomes important. This should not be forgotten! In this 21st century, there are of course many problems. 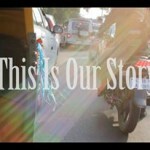 What are the biggest challenges for us? I am not sure… The busy life, the stress, the fear, and also our relationship with our friends, or between the students and the masters, or between the parents and their children and so on… Anything really, any situation is a big challenge. Because what is the problem, really? The problem, one could say, is the lack of inner knowledge -the lack of Dharma knowledge, specifically. As a Dharma practitioner, as a student, we try to learn Dharma because we want to balance the outer world and the inner world -and up to now, most of the population in the 21st century are more emphasizing the outer world. That is what brings the most trouble, one could say. So here, in KIBI, when we learn the Dharma we try to look at our inner value. Once we gain an understanding of this inner value, there is less trouble. Our life then becomes more peaceful and happier. And that is actually what everybody wants: a happy, peaceful life. Every one of us wants a healthy life. When we say “healthy life”, we mean that all the aspects of our life need to be healthy: the spiritual aspect, the mental aspect, the physical aspect, the emotional aspect, and the society as a whole –all of that needs to be healthy. When all of them come together in harmony, then we have a perfect life! And that is actually what Buddha taught; it is the purpose of learning the Buddha-Dharma. When our spiritual life, our mind and our emotions become healthy, then our physical body and our society naturally become healthy; this is very important. The great Kagyu masters have said the same thing: a sign of studying properly is a tamed and peaceful mind. And the sign of a proper meditation is the reduction of one’s disturbing or afflictive emotions. So the more you engage in the study of Buddhism, the more peaceful, calm and humble you become. The more you engage in the practice of meditation, the less afflictive emotions you experience, and the more awareness you develop. If you really understand this, then this will be the result you will get from engaging in studies, contemplation and meditation. If you manage to do that, you can become a good example -the likes of which I have mentioned above. Imagine then, for example, that you become a father or a mother; you would be a very good example to your family -and not only to your family, but to your community, your state, your country or wherever you can contribute. However, if you do not achieve this and do not gain these qualities, then actually there is not much of a benefit in the Buddha-Dharma. At least, one should not be a person creating problems wherever they go -one should not be like that. Wherever you stay, stay without any conflict. This is what you can normally consider the behaviour of a good person, at the very least. On top of these qualities, if someone is engaged as a practitioner of Mahayana Buddhism then one should also develop bodhicitta, compassion. So, by possessing these qualities and bringing harmony and peace into communities and countries, one can consider having a meaningful life. This is what I really think; there is no hidden meaning behind this. If one has these qualities, I definitely think that one’s life is meaningful. When we try to learn the Buddha-Dharma (or any other subject) the biggest obstacle -what I usually call the “turning point”- is that we learn a little bit and then we feel that we actually know something. At that moment, the danger is that if you really do not understand the actual meaning, if you just stay on the surface level, then it brings pride, jealousy and also many different worldly views. This does not only apply to those who study the Buddha-Dharma, but also to those who meditate: when we meditate, there comes a certain point where we feel we reached something. And that is what I refer to as the “turning point”: it will bring thoughts such as “I’m better than you, than him -I know this because I have all these experiences” ¬-so this brings pride, and the ego integrates all of this. Whatever we learn, whatever practice we undertake, these become nothing but a support for our ego, nothing but devotees to our ego. 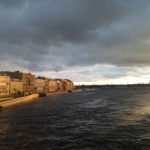 I normally call it the “turning point” because it is returning to the ordinary ways -worse than ordinary ways, actually, because it is a useless kind of Dharma, from which nothing but jealousy, pride and disturbing emotions will develop. Then you will only be thinking about fame, name, position and so on. If this happens, and even if in this life things are good and favourable conditions surround us, then I believe it is the life with the worst kind of accumulation, bringing the worse result for future lives. Therefore it is an important point to be aware of -of course, I believe all of you know this already but still I would like to remind you to be aware of it. Another important point: as students of the Dharma, we need a wider mind, meaning an open mind. If our mind is too narrow then we cannot see reality. Normally I call this wearing the “ego-glasses” -as long as we are wearing these glasses, we cannot see reality. So we need to take off these “ego-glasses”, which represent our individual perspective, our own perspective. So long as we are wearing the glasses of ego, no matter who we are, we cannot see reality; we cannot understand the true meaning of Dharma. That is not just a metaphor -all of us have experienced it and you can see it around the world. For this reason, the Dharma practitioner, the Dharma student needs an open mind. “Open mind” means respecting all schools –all schools, whichever ones exist in this world, one has to respect them. It does not mean that you just follow all schools; if you do so you will lose your destination. So choose one road, one path, and follow it, yet respect the other paths. If you do so, then you are great; if you are a student, you become a great student; if you are a teacher, or a parent, you become a great teacher or a great parent! Especially, as a Buddhist, respect all Buddhist schools, but do not mix! This is very, very important. Because many people nowadays have this idea of mixing different paths and it is not good. Once you choose a path then follow it, yet respect the others with an open mind. That is the thing: as human beings many of us have this idea of bringing peace in the world; if you have this concept or motivation then it becomes your biggest task, your biggest responsibility. And as Buddhist practitioners, of course, that is our biggest practice, according to Atisha. In Atisha’s tradition, there is an instruction saying that one should accept all the Buddha’s teachings in a non-contradictory way. The result of this engagement in the studies and the practice of the Buddha’s teachings will enable one to overcome ignorance. This is the result of studying in the right way. This means that from the Shravakayana up to the Vajrayana one should generate no contradiction on the level of the practice. At a certain level of understanding, a non-contradictory view will arise and this view is associated with the right quality of living and studying the Buddha-Dharma. However, unless you come to that point, or if you take all the different teachings of the Buddha in a contradictory way, this means that you are yet to complete your understanding of the Buddha-Dharma. In brief, as the great Metong Zangpa Rinpoche said: although the different schools are not so different, one should keep one’s own lineage unmixed and that is the only way one can accomplish the fruition of one’s practice. This is the key point of Atisha’s instruction and is a piece of advice you should follow because it will fulfil the aspirations of practitioners. That is all that I would like to say. It is not necessary for me to tell you more because great teachers are here, especially Professor Sempa Dorje, and you receive teachings and advice from them from time to time. Thank you very much and please, study well. 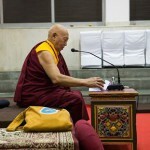 In the beginning I mentioned that Khenpo-la had been a teacher here for a long time and now he is back with us. He accepted to teach in the Meditation Course and today, on such short notice, he accepted to share his thoughts with us. Therefore, on behalf of all KIBI and all students, we would like to thank Khenpo-la from the bottom of our hearts for his sincere and kind teaching. And of course, because KIBI has a long journey ahead, we would also like to request Khenpo-la to visit us often in the future, to spend some time here and share his knowledge with us. Khenpo-la, we wish you a very healthy life and we wish you can spread the Dharma all over the world without any obstacles. Thank you very much for your teaching.